The Staff Association of St. Stephen's College during an emergency meeting on March 1, 2017, have unanimously decided to resign from all administrative positions protesting against College administration’s move to get autonomy from University of Delhi. 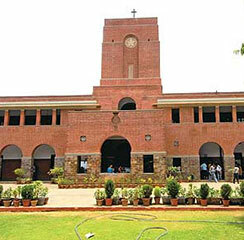 The Staff Association of St. Stephen's College has condemned the alleged threats met out by the Principal, Prof John Varghese, to two teacher representatives on the Governing Body after its meeting held on February 25, 2017, purportedly for giving their dissent on the issue of autonomous status for the college. The association has also demanded an immediate public and written apology from the Principal to the two teachers and an assurance that such intimidation will not be repeated. After the College Governing Council passed the resolution, the student, teaching and non-teaching staff of the College started their protest. Even before the meeting, a petition was signed by over 500 students and 30 teachers and submitted to the Governing Body. The petition appealed to defer the decision to move an application for autonomous status until consultation and consensus is obtained. As per the St Stephen’s Staff Association, the College Governing Body should take back the decision to apply for autonomous status taken in a secretive and hurried manner without application of mind or consultation with stake-holders. It has reiterated that no such decision on a matter that could change the very character of college as a premier public-funded institution, providing high quality affordable education to diverse sections of society, can be taken without in-depth consultation and consensus within the college community of students, teachers and non-teaching employees.